This article discusses the naval weapon category. Mineral mines are discussed individually and by product type. Land mines are discussed under Fortifications. Under international law, minefields must be declared by a belligerent power so that neutral ships can avoid them, but the declaration need only be specific enough to protect neutral shipping, since exact knowledge of a minefield in the hands of the enemy destroys its military usefulness. Thus large areas might be declared mined even though only a small portion of the area actually contained minefields. Straits used by neutral shipping were not to be mined; thus, neither side mined La Perouse Strait, because it was used by neutral Russian shipping. Drifting mines are prohibited unless equipped to become harmless within an hour of being laid, and moored mines are required to have a mechanism to automatically deactivate themselves if they break loose from their moorings. Contact mines are lighter than water and are moored below the surface using heavy cables. They have distinctive "horns" that set off the mine when crushed. Later versions were triggered by the galvanic current generated when copper wires extending from the mine came into contact with steel hulls. Contact mines are swept by using a very heavy cable with cutting blades to catch the mooring cables of the mines and pull them loose for subsequent destruction by gunfire. 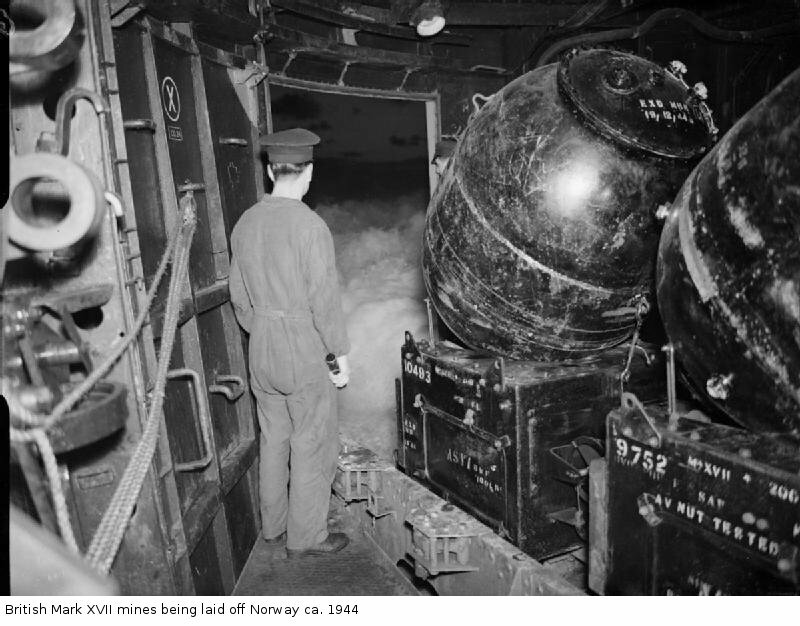 Magnetic mines, introduced early in the European war, are triggered by the magnetic field of steel-hulled ships. They are best swept using a magnetized cable deployed from wooden-hulled vessels (which do not trigger the mines.) Ships could also be protected from magnetic mines by a demagnetization process, but this required fairly detailed knowledge of the design of the mines being protected against. Pressure mines are activated by the increase in water pressure under a moving vessel, and must be swept using a towed hulk large enough to produce the required pressure surge. The Germans developed a pressure mine that they called "Oyster", but for fear of giving it away to the Allies, it was not used until the Normandy campaign. The United States began equipping mines with pressure detonators during the aerial mining campaign of 1945. Acoustic mines are activated by the noise of ship’s screws. They are swept by simulating the screw noises through a powerful underwater speaker. Mines are shallow-water weapons, since none will work properly in deep water. The Japanese employed them extensively at shallow chokepoints throughout their Empire as an antisubmarine measure. For example, the Sea of Japan has five navigable entrances, four of which are narrow and easily patrolled, and the fifth of which (Tsushima Strait) is in shallow water that is well suited for mine warfare. However, the Japanese had to circulate information about their minefields to large numbers of civilian shipmasters, and Allied intelligence soon became adept at intercepting this information and passing it along to Allied submarine commanders. As a result, relatively few Allied submarines were lost to mines. Later in the war, the United States Navy developed FM sonar and paravanes that allowed American submarines to penetrate the Tsushima minefields on 4-24 June 1945 and rampage across the Sea of Japan. This came as a considerable psychological shock to the Japanese, forcing them to institute convoys in the Sea of Japan. Both sides also used mines to protect anchorages. Friendly ships coming into these anchorages had to navigate narrow clear channels to reach their berths. As one may imagine, accidents happened, the worst of which was probably the loss of the President Coolidge to an errant mine off Noumea. Mines can also be used as offensive weapons by placing them around enemy ports or in enemy shipping lanes. Both sides experimented with minelaying submarines, and the Americans actually succeeded in sinking a few enemy ships this way. The small minefields that could be laid by submarine were usually quickly detected and swept by the enemy, so submarine minelaying had to rely on surprise to have much effect. A more successful approach to offensive minelaying was used in the closing months of the war, when American Superfortresses laid thousands of aerial mines in Japanese coastal waters as part of the strategic bombing offensive. These effectively shut down what was left of Japanese merchant traffic and made the blockade of the home islands airtight. The mines remained a serious problem after the war, and the Americans were forced to permit surviving Japanese warships with Japanese naval crews to perform minesweeping for many months after the surrender. The genesis of the postwar Japanese Maritime Self-defense Forces can plausibly be traced to these minesweeping patrols. The Americans made extensive use of mines whenever there was an opportunity for them to be effective. Most used Torpex for their explosive charge. The great majority of American mines were laid by aircraft, with submarines and surface minelayers playing a much less significant role. 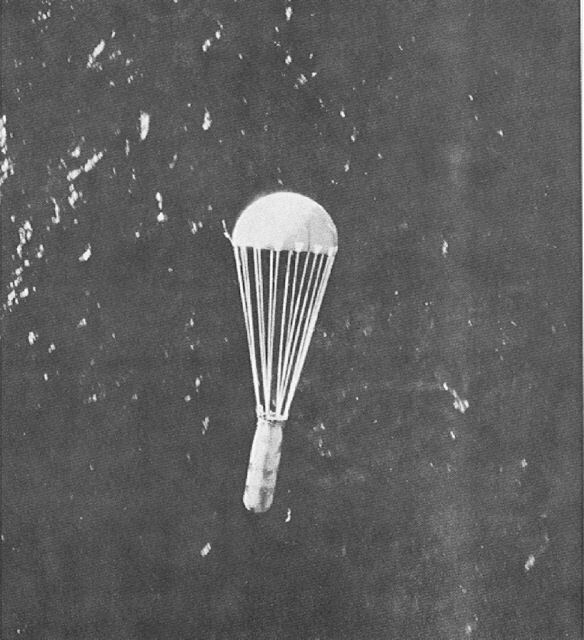 The Mark 12 Mod 1 was equipped with a parachute and could be delivered by a TBF Avenger. This mine was first laid by aircraft on 20 March 1943, when 42 Avengers were used to mine the main anchorage in the Shortland Islands. A simultaneous raid on Kahili by heavy bombers was staged as a diversion and the Avengers were able to make their slow, low-altitude approach undetected. This tactic was repeated the next night by 40 Avengers and 21 heavy bombers. The result was one cargo ship sunk and another cargo ship and a destroyer damaged. More mines were laid in May 1943 that sank a submarine and damaged a light cruiser. The Australians also conducted a campaign of aerial minelaying in the Bismarcks and Netherlands East Indies starting in April 1943. The Australian effort was based on PBY Catalinas, each of which could carry two magnetic mines. About April 1 your mines changed from a nuisance to a problem. We increased the aircraft and searchlight units attached to certain areas such as Niigata and Shimonoseki at the expense of the cities.... The use of aircraft units against dropping of mines by B-29s was more important than protection of the cities because the life lines from the continent which furnished food and supplies were of first priority. The result of the mining ... was so effective that it eventually starved the country. i think you probably could have shortened the war by beginning earlier. The mines used in this campaign weighed either 1000 or 2000 lbs (454 or 907 kg) and had two separate magnetic firing mechanisms (M-9 and M-11), two acoustic firing mechanisms (A-3 and A-5), and one pressure firing mechanism (A-6). The A-3 was fired by propeller noises (200-800 Hz) while the A-5 was fired by subsonic hull noises. The A-5 and A-6 were both considered unsweepable with the methods then in use, but they were not available until late in the campaign. The A-3 was more easily swept, and was susceptible to chain countermining, where the detonation of one mine triggered the detonation of adjacent mines in the field. The Mark 12 was a magnetic mine weighing 1500 pounds (680 kg) that was originally developed for laying from the 21" (53 cm) torpedo tubes of American submarines. A submarine could take two Mark 12 mines in place of a single torpedo, for a typical maximum loadout of about 40 mines. Such missions never engendered much enthusiasm among submarine crews, and were mostly carried out in late 1942 when there was a shortage of torpedoes. Submarine-laid minefields were credited with sinking five Japanese ships in postwar assessments. The Americans also made use of the versatile Mark 6 "K-gun" mine, which was a moored antenna mine designed to be laid by surface ships. The Mark 6 was first manufactured for use in the First World War, was available in large numbers for the Second World War, and remained in the stockpile until the 1980s. 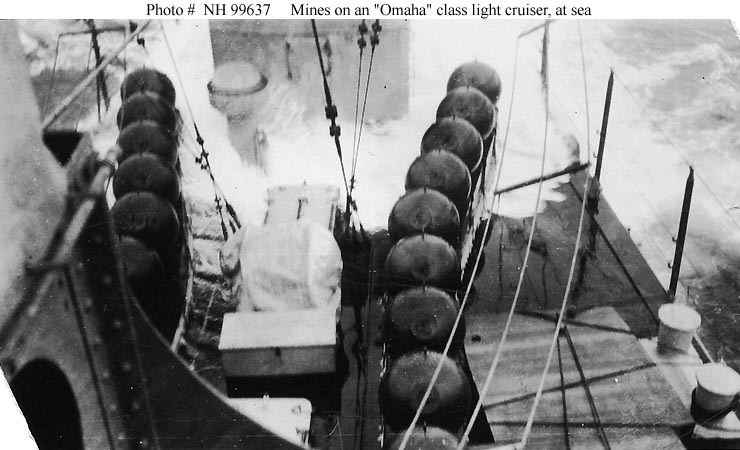 This mine was easily deployed without the use of specialized equipment from almost any oceangoing vessel, which partially explains why only one American warship was laid down and completed specifically as a minelayer. The Mark 6 weighted 1400 lbs (635 kg), carried a charge of 300 lb (136 kg) of TNT, and could be laid in water up to 600 fathoms (900 meters) deep. Fast minelayers laid a field of about 300 mines off Guadalcanal on 1 February 1943, when a large Japanese force was reported gathering for a "Tokyo Express" run. Makinami was sunk by the mine field, but the Japanese were not deterred from beginning their evacuation of Guadalcanal. On 4 May 1943 a group of three fast minelayers escorted by a destroyer laid 250 mines in Blackett Strait west of Vila. The next morning the Japanese suffered a destroyer sunk and two severely damaged. The damaged destroyers were subsequently sunk by aircraft from Henderson Field. Additional minefields laid that month were immediately swept by the Japanese. The British were quite sophisticated at mine warfare, having begun production of an air-deliverable magnetic mine as early as July 1939. The most sophisticated versions were equipped long delay clocks (which allowed a mine to be activated up to 40 days after it was laid), sterilizers to deactivate a mine after a period of time, and counters to cause the mine to fire only after being triggered multiple times. The first British acoustic mines were available in June 1942 and a combined magnetic/acoustic mine was available in April 1943. A combined magnetic/pressure mine was developed but was not ready in time for the war. The British determined that parachute mines could be successfully laid in water as shallow as 30' (9m) from 15,000' (4500 m), but this meant many mines landed out of position or on land where they could be examined by enemy intelligence. Moored mines could be laid from ships in water as deep as 1000 fathoms (1830 m) but were rarely laid in water deeper than 100 fathoms (180 m). Because of the shortage of explosives, most British mines contained Amatol (early in the war) or Minol (later in the war) which economized on TNT by mixing it with ammonium nitrate. 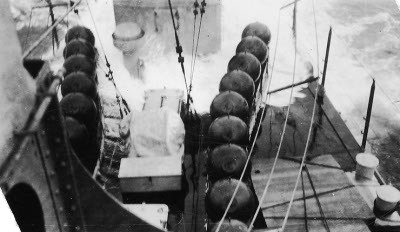 The standard British contact mine was the Mark 17, which could be laid in water up to 500 fathoms (915m) deep and carried a 320lb (145 kg) charge. The A Mark 5 was a magnetic parachute mine designed to fit 1000lb (454 kg) bomb racks. Both Mark 17 and A Mark 5 were available when war broke out in the Pacific. The A Mark 6 was a magnetic/acoustic parachute mine designed for 2000lb (907 kg) bomb racks and carrying 1000 lb (454 kg) Amatol or 1100 lb (499 kg) Minol. It was available from March 1944 and could also be delivered without a parachute at low altitude or from motor torpedo boats. The M Mark 3 or Type J was a magnetic mine for ship delivery available at the start of the war in the Pacific that had a 1600lb (726 kg) Amatol or 1750lb (794 kg) Minol charge. An acoustic fuse was available for this mine from February 1943. The British seem to have made relatively little use of minelaying by submarine, preferring aircraft for offensive minelaying. The Dutch used various imported contact mines, including the Vickers T2 and Vickers H2, both of which had a 441lb (200 kg) charge. The T2 could be laid in water up to 82 fathoms (150m) deep. In early 1942 the Dutch received 96 British magnetic mines, likely A Mark 5s, which were originally intended for Singapore. The Dutch improvised aircraft racks in time to lay 24 of the mines in portions of the Netherlands East Indies overrun by the Japanese. As previously mentioned, the Japanese extensively mined the approaches to the Sea of Japan and also mined areas likely to be traversed by Allied submarines. In general, however, Japanese mine warfare was not very effective. Rabaul, Japan's great base in the South Pacific, had only four minesweepers assigned as late as early 1943. Japan never developed its own magnetic or pressure mines, though a number of captured British magnetic mines were laid off Balikpapan in 1945. The controlled Type 92 mine (1100 lbs or 500 kg of Type 88 explosive) had an acoustic detector. The fact that the Japanese antisubmarine fields were composed exclusively of moored contact mines greatly simplified the task of penetrating the fields with sonar and paravanes. The Type 5 moored contact mine was a 1916 design loaded with 80 kg (176 lbs) of picric acid (Shimose). The Japanese also had purchased thousands of surplus British and American mines left over from the First World War, which would have been almost indistinguishable from the Type 5 in service. The Type 5 was later superseded by the Type 93 mine, weighing 1500 lbs (680 kg) of which 220 lbs (100 kg) was TNT plus powdered aluminum. The Type 93 Model 1 was particularly intended for aerial delivery. The Type 98 Anti-Boat Mine was a 46 lb (21kg) charge in a cast iron body. As the name suggests, it was intended for use against small craft close to shore, and had much too small a charge to seriously damage a warship. 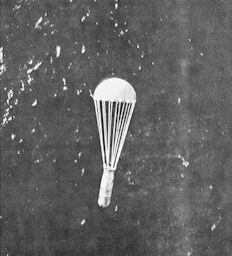 The Aircraft Type 3 Mark 1 Model 1 Parachute Mine was an air-deliverable contact mine weighing 640 kg (1411 lbs) with a charge of 80 kg (176 lbs) of Type 97 explosive. This first became available in 1943 and could be delivered by torpedo bombers. The American Office of War Mobilization (OWM) complained that the Navy had actually overproduced minesweepers in its buildup. Given the weakness of the Japanese mine threat, there seems to be some truth to the accusation, and American minesweepers often found themselves pressed into other duties simply because they were available.